Even though Americans’ desire to read minds vies with that for time travel, Nicholas Epley’s Mindwise is not a book about telepathy, ESP, or psychic reading. The Marist Institute for Public Opinion actually asked citizens what superpowers they’d like to have. Even so, Mindwise will not disappoint. Professor Nicholas Epley, a distinguished psychologist the University of Chicago, writes about the innate knack everyone has to reason about the minds of others. The ability works so quickly and without effort that we neither notice when we use it, nor stop to wonder if our assumptions about another’s mind might be wrong. And therein lies the meat of this book. Epley lays out his argument alternately as thesis and antithesis in clear, engaging prose. He cites plenty of research, but illustrates his examples from everyday life and popular culture. This makes for enjoyable reading. For example, many assume that it is hard to hold a poker face for long because true feelings leak out in subtle expressions and gestures. Little evidence supports the validity of these “microexpressions,” on which three television seasons of Lie to Me are based. The show is clearly fictional, but that didn’t stop the TSA from training 3,000 analysts (as of 2010) to “spot microexpressions and other purportedly subtle clues of deception.” The effort was a bust. People generally believe that they “read” others by picking up on subtle body language, or switching perspectives by putting themselves in another’s shoes. Both approaches have an intuitive appeal. But a characteristic of science is that it is often counterintuitive, meaning that what stands to commonsense reason is wrong. And so it is that reading body language and perspective–taking are both misguided according to Epley. If you want to know, he says, ask rather than guess. Other minds are never a completely open book. 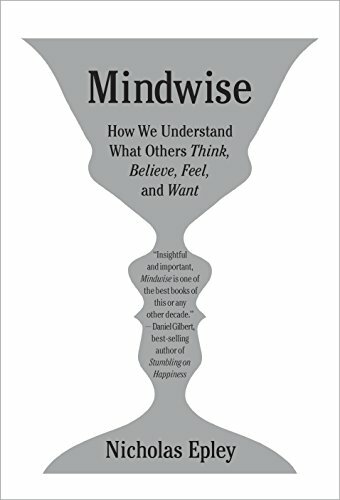 The secret to being “mindwise,” the author says, is instilling sufficient trust so that others can “tell you their minds openly.” This is a disarmingly simple rule. Yet in navigating convoluted social lives we fail to heed it. Our already facile propensity to infer intentions then leads to errors: We either fail to recognize a mind in those we consider inferior or contemptible, or we attribute one to inanimate objects and end up talking to plants, cursing computers, and attributing intent to random acts of nature. Surprisingly, current science shows that one must understand him- or herself before being able to read another, making the Oracle at Delphi’s advice unassailable. Yet even when self-understanding is achieved, the problem with imagining another’s perspective is that one’s own doesn’t feel unique until happenstance shows that it is. Temple Grandin, for example, a famous autistic individual, had always assumed that others thought in pictures the way she did. Not until college did she learn that most people thought verbally rather than in images.